A direct contact via R4UAB with students at The Center Of Supplementary Education For Children Of Ruzayev District, Mordovia Republic, Russia was successful 2014-08-30 10:00 UTC This contact was part of the About Gagarin From Space program. Watch a video recording of the event at: http://r4uab.ru/?page_id=6368. A direct contact via RA1AJN with students in St. Petersburg, Russia was successful 2014-08-28. 11:40 UTC. A direct contact with students at Dorothy Grant Elementary School, Fontana, CA, USA was successful Wed 2014-08-27 18:31:28 UTC 83 deg. Astronaut Alexander Gerst, KF5ONO was able to answer 7 questions for students during the communication window. Dorothy Grant Elementary School opened its doors in August 2004 and was named after a local prominent, nationally renowned civil rights leader who passed away in April 2013. Mrs. Grant was vested in education, and could be seen most mornings at our school gates welcoming our students to school. Our school is a community school located in the middle of a residential neighborhood and serves over 780 students in preschool through grade 5. We also have an early childhood special education program and Special Day Class for 5th grade students. Many of our students participate in our after-school program, as well as a variety of school clubs that are headed by teachers or parents, such as the gardening club. Dorothy Grant Elementary School proudly earned the California Department of Education’s 2013 Title I Academic Achievement Award and is a California Distinguished School. This prestigious honor is a reflection of the school’s system of support for all students at all learning levels. Innovative intervention strategies and differentiated instruction greatly impacted school-wide student performance to meet state and federal standards of excellence. On October 27, 2012, the Dorothy Grant Elementary Amateur Radio Club was established. Each year nearly 50 students in the 4th and 5th grades learn about amateur radio and participate in activities and programs that teach them about electronics and radio communication techniques. Amateur radio has enhanced reading, writing, mathematics, geography, and communication skills for all students. The club recently installed a 50 ft. Rohn tower and beam antenna in hopes of making more international contacts on 10, 15, and 20 meters. The use of technology is strongly emphasized throughout the curriculum and used as a tool to enhance class lessons. A telebridge contact via IK1SLD providing an interview for students at SPACE KAMP Sterrenlab, Noordwijk, The Netherlands with astronaut Alexander Gerst, KF5ONO was successful Tue 2014-08-26 11:36:32 UTC 65 deg. Gerst answered 18 questions for students. Listen to an audio recording of the contact. The Amicale Space Camp includes 25 children aged 8-13 years old of different European nationalities. It includes children of the European Patent Office staff and takes place in Noordwijk (Stay Okay hostel) from the 25th to the 29th of August 2014. All camp activities are designed to entertain children, stimulate their creative and manual skills, and teach them about science and space. The contact with the International Space Station will be a key activity in the program as it gives the children the opportunity to talk with an astronaut and understand that space is an international endeavor. A direct contact with students at Winfree Bryant Middle School, Lebanon, TN, USA was successful Tue 2014-08-26 16:12:47 UTC 24 deg. Astronaut Gregory Wiseman, KF5LKT answered 16 questions for students. As one of two middle schools in Lebanon Special School District, Winfree Bryant Middle School is in its fourth year of serving students in grades 6 – 8. Located in Wilson County in the heart of middle Tennessee twenty-eight miles east of Nashville, the city of Lebanon has approximately 27,000 residents. Winfree Bryant serves approximately 600 students with 66.5% Caucasian, 16.6% African American, 14.4% Hispanic, 2% Asian, and less than 1% Native American/Mixed Race. Forty-eight percent of the school population is female and fifty-two percent of the population is male. Approximately 65% of students fall within the demographics of economically disadvantaged. Winfree Bryant’s mission statement is “Different and Making a Difference.” As a school family, that is what teachers and staff set out to do on a daily basis. Although our number one responsibility is to teach Tennessee State Standards and grow students academically, we first love our children and provide for their daily needs. Without relationship, there can be no learning, and our teachers and administrators take very seriously the mission of making a difference in the lives of the children and families we serve. The faculty and staff embodies this mission by never giving up on a child – academically, emotionally, and socially. Expectations for academics are high and behavioral expectations are rigorous in order to best support a positive learning environment. In return, we look forward to a harvest of hardworking responsible citizens who then make a difference in a positive way to our community. A telebridge contact with students at Zuni Hills Elementary School, Sun City, AZ, USA, via K6DUE was successful.Fri 2014-08-22 17:47:05 UTC 45 deg. Astronaut Greg Wiseman answered more than 18 questions for the assembled students and audience. Zuni Hills Elementary School is a K-8th grade school and falls in the Peoria Unified School District. Our district is the third largest in the state of Arizona with 33 elementary schools and 7 high schools. Our district is celebrating its 125th anniversary this year. Our district has a 95% graduation rate and last year students accepted more than 50 million dollars in scholarships. The ARISS-Russia team coordinated the hand deployment of a CubeSat with help of Cosmonauts Oleg Artemiev and Alexander Skvortsov during a Russian EVA that was conducted on Monday August 18. The CubeSat, called NS-1 “Chasqui”, was co-developed as a STEM education activity co-sponsored by a Russian-Peruvian team. The CubeSat plans to send down SSB beacon messages every two minutes on 437.025 MHz and downlink its telemetry over the Kursk University in Russia. A telebridge contact with students at Canada Science and Technology Museum Summer Day Camps, Ottawa, ON, Canada via IK1SLD was successful Wed 2014-08-13 17:18:49 UTC 65 deg. The Canada Science and Technology Museum is a national museum located in Ottawa, Ontario, Canada. The Museum’s day camps are a large part of the educational strategy of the Museum to cultivate scientific, technological and engineering literacy in Canada. Our Summer Camps programs have run for over 12 years for children aged 6-12 with a curiosity for science. Each of the five camps has a different theme incorporating various aspects of science, technology and engineering: Adventures in Science (ages 6-8), Gadgets and Gizmos (ages 6-8), Junior Astronomers (ages 6-8), Ultimate Builders (ages 9-12) and Adventures in Robotics (ages 9-12). A direct contact via 8J3AK with students at Amino Kita Elementary School, Kyotango, Japan on Wed 2014-08-06 10:25:43 UTC 68 deg was successful. Students conducted the interview in English with astronaut Gregory Wiseman, KF5LKT and received answers to 23 questions. Amino Kita Elementary School was opened on April 1, 1983. Our school is located at the northernmost tip of Kyoto Prefecture in Japan. We have 244 students now, who all study hard and pursue sports actively. Our school is surrounded by a rich, natural environment. The location of our school is recognized as a part of Quasi-National Park and the National Geo Park. It is also only 100 meters away from the beach. Students in the 6th grade swim one kilometer in the sea every year. During the current season, summer, a lot of lights from squid fishing boats can be seen in the sea at night. Maybe you can see them from the ISS? Our school has beautiful grounds covered with green grass. At recess, our students play in the grounds full of energy. There are straight hallways more than 100 meters long in our school. They are sometimes used in our arithmetic classes to learn how to measure distance. The members of our space club will ask you some questions today. These questions were thought of by all of the students. It is a new club that began this year. They are studying the stars and moon, and practicing English hard so that they can make contact with you. All of the people in our school are really looking forward to getting in touch with the astronauts in the ISS. On July 16, 2014 the French State Secretary for Digital Affairs, Axelle Lemaire, responded to a request by the Deputy of Haute-Vienne Province, Daniel Boiserrie, authorizing French students to participate directly in ARISS educational school contacts under the supervision of a licensed operator. Until now, the French administration was very restrictive. For direct school contacts, the operator read the questions prepared by the students. Even this is "third party", but was tolerated by the French regulatory authority. Most European countries allow students to participate directly in ARISS school contacts under the supervision of a licensed operator. Permission to do so requires varying procedures from country to country, but the issue of enabling "third party" communications can generally be solved. Until now, the only exception was France. Notwithstanding years and years of efforts, French schoolchildren had no access to the mike for direct amateur radio communications with the ISS. The letter from the Secretary of State in charge of telecommunications now changes the game. On behalf of the European ARISS partners, Gaston Bertels, ON4WF, ARISS-Europe Chairman, extends thanks to Sylvain Valat, F1UJT, who led this successful effort. A telebridge contact via W6SRJ with Scouts at Space Jam 8, Rantoul Airport & Chanute Aerospace Museum, Rantoul IL, USA was successful Sat 2014-08-02 12:23:19 UTC 60 deg. Astronaut Reid Wiseman, KF5LKT answered 26 questions asked by Scouts during the pass. Greetings to all stations from the participants and volunteers of Space Jam 8 in Rantoul, Illinois. Though primarily a weekend Scouting and STEM education event, we are open to all interested youth. Boy Scouts, Girl Scouts and Venturing Crews from 22 states and this year Canada have come together in an educational and fun format to learn more about the life skills that will prepare them for the increasingly complex technological future. While it is well known that Scouting teaches pioneering skills like camping and wilderness survival, the new pioneers and wilderness are in outer space and we are working hard at 44 technology oriented Merit Badges and activities, plus some fun things like the Duct Tape Merit Badge and experiencing 1/3 gravity. Talking to the astronauts on the ISS is an unforgettable part of the experience at Space Jam and that's next on our list. We will not know for many years whether one of these youths becomes an astronaut themselves but it is certain that they are all part of tomorrow's leaders. A direct contact via DN4OD between students at Gymnasium Markt Indersdorf, Markt Indersdorf, Bavaria, Germany, and astronaut Alexander Gerst, KF5ONO was completed Sat 2014-06-28 12:08:21 UTC 70 deg. Unfortunately the contact was compromised by local interference; the cause is being investigated. Students were able to receive answers to 6 questions. The grammar school/high school of Markt Indersdorf (Gymnasium Markt Indersdorf GMI, Germany) began operations in the school year of 2001/2002. In 2007 the first students graduated successfully with the certificate qualifying them to go to university (Abitur). Currently, about 90 teachers instruct approximately 1,100 pupils aged 10 to 19, about 250 of them are in the qualification phase (years/grades 11 and 12). The GMI offers the choice between two faculties, the linguistic and scientific-technological one. Approximately 75 percent of the pupils decide for the latter. The pupils obtain an education in science from the 5th year/grade on, the subject Physics is taught from year/grade 8 on for both faculties, in the scientific-technological profile additional hours for more in-depth education are mandatory. In years/grades 11 and 12, the pupils have the choice between Physics, Chemistry and Biology. Experience has shown that about 30 to 40 per school year decide to take Physics. About half of them vote for Astrophysics in the 12th year/grade. From 5th year/grade on, all pupils study English as their first foreign language. • Public Relations (local and trans-regional): Press, TV, radio and website. Pupils of all ages should participate in selecting the questions to the astronauts. The examination of questionnaires of other schools which already made contact with the ISS should secure the creation of uncommon and interesting questions that are not asked in every interview. At the event in question - depending on the date and time - a large number, if possible, of the school family should be present in the assembly hall, for example, to attend a live broadcast from the radio room. Current discussions between the ARISS team and NASA suggest the possibility of voice contacts with the International Space Station (ISS) during Saturday’s ARRL Field Day activities this coming weekend. In a June 23 email, Kenneth Ransom, the ISS Ham Radio payload developer, stated “I have received a response from astronaut (Reid) Wiseman that he is willing to try and work some stations on Saturday. Pass times begin very soon after the start of Field day.” Wiseman would operate under the call sign, NA1SS. Should Alex Gerst participate, he would use the call sign, DP0ISS. If voice operation does occur, It will likely take place from the Columbus (COL) module using the standard Region 2 uplink frequency of 144.49 MHz and 145.800 MHz for downlink. It’s expected that the packet system will be operational on 145.825 MHz during periods when the crew is not available. It’s not clear whether any of the Russian crew would participate from the Russian module, but if so, they would be directed to use 437.550 MHz for any contacts using the call sign RS0ISS. The COL would also be available to their crew using the VHF frequencies above, if Wiseman is not operating. Listed below are approximate pass times and a chart showing ISS passes for the Field Day weekend. The pass times shown are not definite, scheduled times with the crew. They may or may not be able to support these times. And, updates to this tentative plan will be released as they become available. A telebridge contact with European Space Center, Transinne, Belgium telebridge via IK1SLD was successful Fri 2014-06-20 18:36:47 UTC 46 deg. The planned telebridge contact with Focus Camps – Sterrenlab, Italy at the same time was not possible due to phone line failure impacting the entire town. 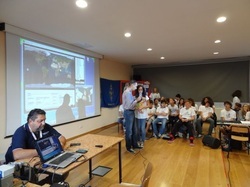 The radio contact with the ISS was to take place during the Focus Campus, a science summer camp addressed to children aged 8 to 13 organized by Focus Junior - the most popular science magazine for children in Italy - and Sterrenlab, the camp organizer. During the week children will participate to science laboratories, learn about science topics and challenge themselves to design and build experiments and machines. The Focus Campus in Candriai (Trento) focuses on tinkering and DIY activities ("Una scienza da creare" - "A science to create"). Children will also have the opportunity to do sport in the morning, play with their friends and visit the alpine nature surrounding the camp premises. Amateur Radio on the International Space Station (ARISS) will have a prominent place at the third annual ISS Research and Development Conference this week. The conference, organized by American Astronautical Society (AAS) in cooperation with the Center for the Advancement of Science in Space and NASA, takes place June 17-19 in Chicago. More information is published in this American Radio Relay League (ARRL) news story: http://www.arrl.org/news/view/amateur-radio-role-on-space-station-featured-at-iss-research-and-development-conference. A direct contact with Slavic Nations Ham Radio Conference, Sochi, Russia was successful Thu 2014-06-12 15:40 UTC. The Radio Amateurs of Canada (RAC) has appointed Ian MacFarquhar, VE9IM to be the new ARISS Regional Representative. Ian replaces former representative, Daniel Lamoureux, VE2KA. A direct contact with students at Aboshinishi Elementary School, Himeji-City, Japan, via 8N3AB was successful Tue 2014-04-29 09:05:15 UTC 80 deg. Astronaut Koichi Wakata, KC5ZTA answered 30 questions for students. The Aboshinishi elementary school founded in 1976, is a small school in western Himeji-city with a total number of 359 students. A direct contact with students at Dixon Elementary School, Holly Ridge, NC, USA via NC4OC was successful Mon 2014-04-21 18:05:53 UTC 41 deg. Astronaut Koichi Wakata, KC5ZTA answered 20 questions for students. Dixon Elementary School is located in a rural setting, with its feeder communities North Topsail Beach, Sneads Ferry, Holly Ridge and Surf City. Our community has seen sharp rises in the population of retirees and young families both military and civilian. With the deployment of large numbers of military personnel to Camp Lejeune, New River Air Station, and MARSOC (Marine Special Operations Center) at Stone Bay, the Dixon area continues to grow. Our school population as of February 2014 is over 900 students. Dixon Elementary is a Title 1 School with 38% of our students receiving free or reduced meal benefits. Our student population consists of 81% white students, .09% American Indian, .06% Hispanic, 9% Black, 2% Asian and .007% Pacific Islander. Dixon Elementary was initially accredited by AdvancEd in 1978. Students are served by highly qualified teachers in 38 regular classrooms, three self-contained exceptional children's classrooms and two pre-kindergarten classrooms. There are six highly qualified resource teachers who also offer support to our large population of exceptional children. Dixon Elementary is a charter member of the National Elementary Honor Society and the Global Schools Network. In the fall of 2012 Dixon Elementary implemented a STEM classroom for instruction in science, technology, engineering and mathematics for students in grades K-5. Students rotate through the STEM classroom every 7 days. The STEM classroom teacher, a veteran science and math teacher, provides hands-on science and math instruction and project-based learning, including a variety of engineering projects. Each year Dixon Elementary hosts a SPACE DAY for students in Pre-K through 5th grade, with our community joining us in this spectacular event. Students at Dixon Elementary students think strategically as they learn to play chess, participate in book studies, Scrabble Club, Robotics Club, Girls on the Run Club, Boys' Running Club, Academic Derby, Recycling Club (recently recognized by the National Council of Keep America Beautiful as the leading public school in recycling), Odyssey of the Mind (world competitors two out of the last three years), Science Fair competitors (Regional, State and National champions), and Science Olympiad. For more details, read the current HamTV Bulletin. The final Ham Video Commissioning Pass 4 is planned Sunday April 13 at 18.23 UTC. For more details, read the current HamTV Bulletin. Presently, Ham Video is transmitting permanently a "blank" image and no audio in configuration 5. For more details, read the current HamTV Bulletin. A direct contact with Secondary School № 2, Obojan Kursk Region via RD3WAY was successful 2014-03-04 10:20 UTC. A direct contact with winners of the "Ask your question of an astronaut" contest at the Center of Space Communications, St. Petersburg via RA1AJN was successful 2014-03-03 09:33 UTC. A direct contact with the Centre for Tourism and Youth Policy, Ruzaevo Municipal District, Republic of Mordovia via UB3UAD was successful 2014-03-02 10:24 UTC. A direct contact with Children and Youth Centre "Galaxy" of Kaluga via RK3X was successful 2014-03-01 11:12 UTC. A direct contact with Polytechnic College Number 42, Russia, on Space Experiments "Gagarin of the Cosmos" via UB3AFD was successful Sat 2014-02-22 13:40 UTC. A telebridge contact via W6SRJ with students at Melbourne Grammar School – Grimwade House, Caulfield, Victoria, Australia was successful Tue 2014-03-25 08:43:15 UTC 79 deg. Astronaut Koichi Wakata, KC5ZTA answered 20 questions for students. Melbourne Grammar School – Grimwade House is a co-educational Primary School with 650 students aged from 5 to 12 years old. Grimwade House bases its education on the Australian Curriculum. One of the Major Learning Areas outlined in the Australian Curriculum is Science. Grimwade House is fortunate to have a purpose built Science room and a teacher who is dedicated to and passionate about the teaching of Science. All students from Prep to Year 4 have one lesson of Science per week and Year 5 and Year 6 students have a double lesson of Science each fortnight. - Students investigate insulation and other elements astronauts need to consider when exploring our place in Space. Transmission will continue in this configuration till the end of the week. On Sunday March 23, Ham Video will start transmitting in configuration 4, i.e. 2395MHz and 2.0 Ms/s. For details on future plans, read today's HamTV Bulletin. A contact between astronaut Koichi Wakata KC5ZTA with students at Forest Knolls Elementary School, Silver Spring, MD, USA was successful Thu 2014-03-20 14:38:33 UTC 68 deg. The contact was direct via KB3WOA. Astronaut Wakata answered 20 questions for students. Forest Knolls Elementary School is a PreK-5 school in Silver Spring, MD, about 8 miles outside of Washington, DC. We are also only a few miles away from NASA Goddard Space Center in Beltsville, MD. The school has over 700 students with a very diverse ethnic population with students from 18 countries. There are 16 different languages spoken, and about one-third of the students are Hispanic. It has an inclusion program for physically disabled students. We also have a Communication Arts program, in which the students focus on Research, Written Communication and Media Production. Susan Michal, magnet coordinator, integrates this program into all classrooms at all grade levels. There is a school amateur radio station, KB3WOA, which holds an after school club under the direction of one of the teachers, Melissa Happ, KB3VEX and her husband, Tom Happ, KJ4YFH. There are about 15 students involved in the after school club. The radio station is also used with classes, at various grade levels, as part of the curriculum in Social Studies and Communication. A direct contact with students at Warren Consolidated Schools, Warren, MI, USA via W8HP was successful Fri 2014-03-14 11:24:58 UTC 55 deg. Astronaut Koichi Wakata KC5ZTA answered 24 questions posed by students. Watch an event video produced by the local ham radio community:https://www.youtube.com/watch?v=sCm6pHf_XE0. The mission of the Warren Consolidated Schools (WCS) district, in partnership with families and community, is to achieve a level of excellence in teaching and learning which enables all students to become knowledgeable, productive, ethical, and successful citizens. To help meet that goal, WCS supports programs in Science, Technology, Engineering, and Mathematics (STEM), which give students a real hands-on experience in education. The Middle School Mathematics Science Technology Center [(MS)2TC] has been built on the Warren Consolidated Schools district's internationally successful high school, the Macomb Mathematics Science Technology Center (MMSTC). While the high school program integrates seamlessly mathematics, science and technology, the middle school program integrates mathematics, science and informational literacy (reading and writing) with technology infused into each area. Both programs provide students with real-world, project-based learning activities that challenge their thinking, broadens their understanding of the world, and stretches their knowledge base while meeting the developmental needs of the students they serve. The (MS)2TC student population consists of students from five different middle schools within the WCS district while the MMSTC student population draws from eleven different school districts within the county of Macomb in southeastern Michigan. Both schools serve a diverse community of students who come from various socioeconomic and ethnic groups. The program goals of the MMSTC and (MS)2TC are to research, design, implement, and develop a powerful, unique learning environment and experience for high achieving students at the middle school and high school level that integrates mathematics, science, English language arts, and technology. To achieve this goal we have created a curriculum framework based upon the Next Generation Science Standards (NGSS) which integrates mathematics and literacy standards mirrored in the Common Core State Standards (CCSS). Astronaut Koichi Wakata KC5ZTA spoke with students at H. J. Cambie Secondary, Richmond, British Columbia, Canada, in direct contact via VE7RAR Thu 2014-03-13 16:58:27 UTC 54 deg. HJ Cambie Secondary is a public school in the Richmond School District in British Columbia. We enroll approximately 700 students from grade 8-12. Cambie is comprised of a diverse cultural population of students. The student population of Cambie is composed of many different cultures along with thirty different language groups – 67% of our student population speaks a language other than English at home. Cambie students are known for being strong leaders in our community. We offer a variety of courses in Mathematics, Sciences, Social Studies, the Arts, Business Ed, Athletics, and Modern Languages. Cambie has a thriving Leadership program that begins in Gr 8 with our Pathways program. Students in our leadership program give back a great deal to our community and fundraise for local charities. We have a strong Health Science program with work experience opportunities for our students and First responder training. In addition, Cambie has a world-class robotics club who competed at the World Robotics Championships last year in Orlando. Cambie students are comparing the uniqueness of the ARISS contact to the first steps on the moon! This is a once in a lifetime experience for them and big on the "coolness factor"!!! We feel like we have won the lottery! This opportunity has brought a new energy to our classrooms. The staff and students are engaging in learning on levels that transcend the classroom walls. Music classes are performing space theme songs, computer CADD classes are designing digital mission patches, foods classes are learning about nutrition in space and our Health Science students are discussing how physiology is affected with space travel! The engagement opportunities the ARISS contact has provided our school are endless. We are celebrating the March 2014 ARISS contact with a 1.5 hour live show with speakers from MDA (makers of the Canadarm) and Urthecast (who’s cameras were just installed on the ISS), and interactive shows from Science World and the HR MacMillan Science Centre. Our ARISS contact is being video simulcast to a second gym in our school (where many elementary students are also joining us), and broadcast to the web where other schools across the district (and world) will be watching the live video feed! The Ham Video transmitter commissioning steps 1 and 2 were performed as planned. 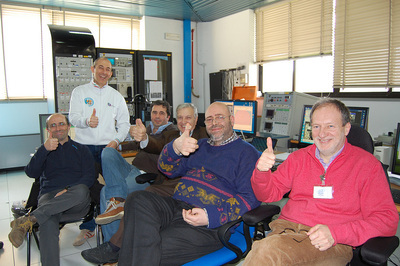 Working together with ESA / B.USOC, the ARISS team in Matera did an excellent job. On Saturday March 8, 4 configurations were tested with antenna 41. 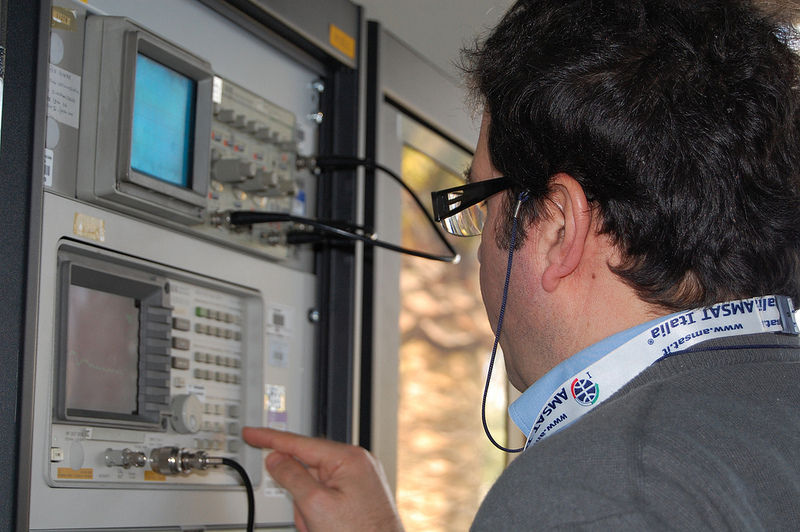 On Sunday March 9, 6 configurations were tested with antenna 43. Read the latest HamTV Bulletin for more details and information on future plans..
A news story published by ARRL, Inc. provides more details on the test transmissions: http://www.arrl.org/news/ham-video-transmits-live-images-of-astronaut-mike-hopkins-kf5ljg-from-the-iss. On Saturday March 8, 2014 ESA proceeded to step 1 of the Ham Video Commissioning process. Michael Hopkins KF5LJG operated the Ham Video transmitter while an ARISS team received the DATV signals at the VLBI station in Matera, Italy. 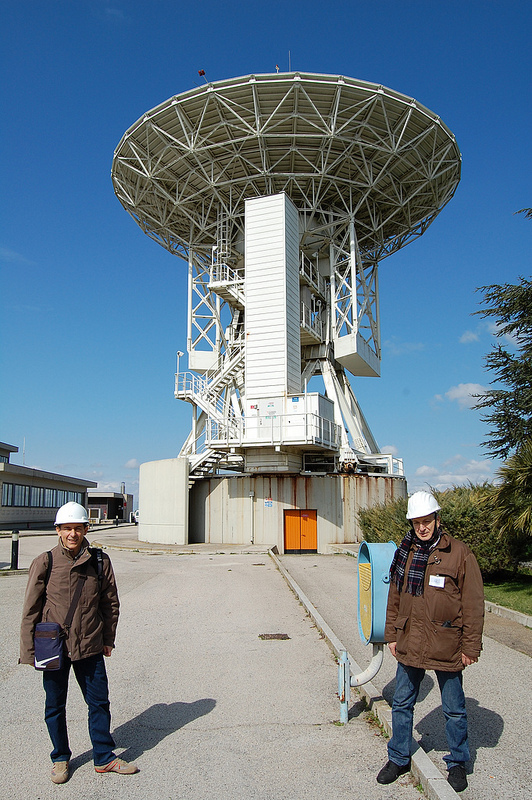 ARISS has permission to use the 20m dish of the VLBI telescope in southern Italy for HamVideo commissioning. Very Long Baseline Interferometry (VLBI) is a radio astronomy technique which uses an international chain of ground stations. The 20m dish is part of the Centre for Space Geodesy (CGS) of the Italian Space Agency (ASI). Using the Matera dish, S-band DATV can be received for 8 minutes during a pass of the ISS. This time is needed for testing the Ham Video transmitter in different configurations. During the Saturday pass, the configurations were tested with ARISS antenna 41 with good results. On Sunday March 9, the configurations were tested with ARISS antenna 43, also with excellent results. Presently the Ham Video transmitter is running permanently without camera. Amateur operators are invited to file reception reports of this "blank" transmission. Details are provided in Ham Video Bulletins, available on www.ariss-eu.org. The next commissioning step is planned for April 12. 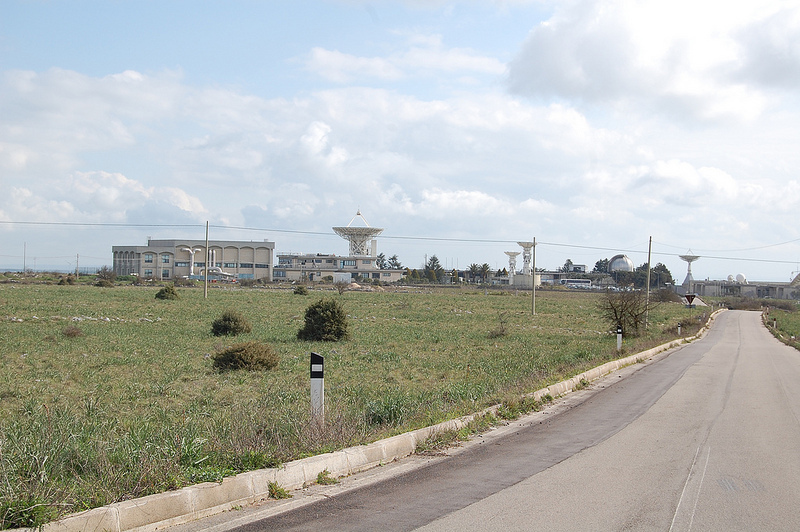 Photos below of the ground station in Matera, Italy are provided by Francesco De Paolis IK0WGF. A direct contact between astronaut Mike Hopkins KF5LJG and students at Rock Bridge Elementary School, Columbia, MO, USA via KMØR was successful: Wed 2014-03-05 14:00:13 UTC 33 deg. Rock Bridge Elementary School is a K-5 public school operating within the Columbia Public School District. It is located in Columbia, Missouri. The school offers a core curriculum, with emphasis on science, technology, and math. Rock Bridge has a strong belief that in order to prepare students for success in the 21st century, today’s learners must be able to think critically and creatively, work collaboratively, and master an ever growing list of skills. The student body is made up of 672 students from all over the Boone County, Missouri area. The school has 24 classroom teachers, 6 special area teachers, 5 teaching assistants in addition to 2 pre-school teachers. The school’s mission is to cultivate learners and leaders who are inspired, able, and prepared to make a positive difference in the world. A direct contact between astronaut Mike Hopkins, KF5LJG and students at Central Square Middle School, Central Square, NY, USA was successful 2014-03-03 14:05:15 UTC 31 deg. Because of technical difficulties, students were able only to receive replies for two questions. The Central Square Middle School (CSMS) has approximately 1000 students in grades 6, 7, and 8. CSMS is actually 3 schools within a school that function on their own. Each school has grades 6, 7, and 8 and is identified as House 1, House 2, or House 3. Students are assigned to a grade-level team within a house. Students in grades 7 and 8 can participate in interscholastic athletics of many types. There are also many clubs that all grade levels can participate in throughout the year including (to name a few) Leadership (Student Government), Fishing Club, Chess Club and Amateur Radio Club. Amateur Radio Club, KC2ILA, has been active at CSMS for more than two decades. We acquired our call sign in 2001, but used our club advisor’s call sign before that. Over the years we have been involved in various electronic construction projects, KC2ILA is always a presence on the air during School Club Roundup in February, and we are always tracking spacecraft carrying Amateur Radios. Over the years several students have spoken with astronauts on space shuttles and students at CSMS spoke with 5 of the 7 NASA astronauts and several cosmonauts, who resided on the Mir Space Station. In September 1994 CSMS organized a scheduled contact between astronauts on Space Shuttle Discovery (STS-64) and students from 8 school districts in Central New York. The radios for the contact were located at the Museum of Science and Technology (MoST) in Syracuse, NY. 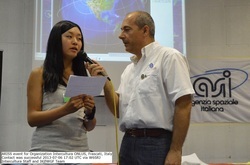 In the spring of 2013 several club members worked on preparing the application for another scheduled contact, this time with the International Space Station. We are hoping this conversation goes as well as our first scheduled contact! According to Gaston Bertels, ON4WF, ARISS-Europe Chairman, the Ham Video transmitter, which is stored in the Columbus module of the International Space Station, will be installed March 6, 2014. The transmitter will be powered on briefly. The first Commissioning step is planned March 8. For full details read Bertels' March 2 HamTV Bulletin. was successful Sat 2014-03-01 08:14:19 UTC 60 deg. Twenty-two questions were answered by astronaut Koichi Wakata KC5ZTA. Wallingford STEM Academy is a community based and family oriented organization the excites students about science, technology, engineering and mathematics. This program, previously known as the Young Astronaut Club of Wallingford and founded in 2000, has been providing STEM enrichment for students in grades 4 through 8 for over thirteen years through Wallingford Youth and Social Services. The Wallingford STEM Academy is a collaborative partnership between the Spanish Community of Wallingford (SCOW), the Town of Wallingford Youth and Social Services Department (WYSS), the Wallingford Education Association (WEA). STEM Academy branches in Wallingford, and Hamden, are the flagship programs for CEA’s STEM Education Initiative. We currently serve the Spanish Community of Wallingford (SCOW) and the general population. 40% of our STEM Enrichment Academy is comprised of students from the Spanish community and 40 % of our students are girls interested in STEM education. Our weekly meetings are conducted at the Spanish Community of Wallingford Great Room and in our STEM Education Classroom next to SCOW. Since 2005, a companion project to Wallingford STEM Enrichment Academy is the Wallingford Family Science and STEM Night Series. At least twice a month, we organize and implement family oriented Science and STEM Family Nights in Wallingford. These events range from evening programs, daytime vacation programs, hands-on investigations, assembly style programs, and night sky observations. The purpose of this organization is to deepen student, and family, understanding of STEM concepts as a compliment to an existing inquiry based STEM curriculum in Wallingford. Our major funders for both STEM Academy and Wallingford Family STEM Nights are the Wallingford Rotary Club’s Wallingford Foundation, 3M Charitable Contributions and the Connecticut Education Association. A direct contact with students at Collège Les Gondoliers, La Roche sur Yon, France with astronaut Koichi Wakata was successful Friday, January 17th at 09:51:13 UTC 34 deg. Wakata answered 17 questions in English. His answers were later translated to French for the audience of 200 students, teachers, media and radio amateurs in the gymnasium. Les Gondoliers Secondary School, with its 500 pupils -aged 11-15- is located in Vendée, 70 km south of the city of Nantes, where famous Jules Verne author was born . At the end of the last year, the pupils take an exam called "Diplôme National du Brevet". Our Astronomy Club has resumed its activities this year with the objective to enter in contact with the ISS. The starting point has been the visit of the exhibition “Voyages planétaires” (Planetary spaceflights), in Nantes, during the International Planetary Science Congress. Various astronomy and amateur radio activities will be organized, with the help of members of the association of "radioamateurs of Vendée", who will come to our school to display their activities and provide us with the tools that will be necessary to get in contact with the ISS. The following contacts with the ISS were conducted successfully today. Zespół Szkół Technicznych, Ostrów Wielkopolski, Poland, direct via SP3POW: Wed 2014-01-08 10:43:57 UTC 51 deg. Astronaut Koichi Wakata, KC5ZTA answered all 15 of the prepared interview questions. For local news stories about the event: http://www.youtube.com/watch?v=s6tXgBqadiE and http://www.ostrow24.tv/film/8075-ostrow-polaczyl-sie-ze-stacja-iss.html. The Centre of Technical Schools in Ostrów Wielkopolski is a school which educates future electronics and mechatronics engineers, computer scientists and renewable energy specialists. Our school has been cooperating with Polish universities, electronic and mechatronic industrial plants and schools in Germany and the UK, what brings very good results. Thanks to the participation in the ARISS program our school has partnered with the Space Research Centre of the Polish Academy of Sciences in Warsaw. Our students participate in various forms of extra-curricular activities which develop their passions and interests. As a result, they have created many interesting electronic and mechatronic devices. For example, some of the recent constructions include fpv plane, a qudrocopter, a stratospheric balloon capsule, some amateur radio equipment and many more. Currently, the school has 800 students aged 16 - 19 years. The Center of Technical Schools has invited its younger mates (students 13 - 15 years old) from Junior High School No. 1 named of Polish Nobel laureates in Ostrów Wielkopolski and 10 - 12 year-old students from Pope John Paul II Primary School in Lamki so that they all can participate in the ARISS program. Preparations for the ARISS contact began in late 2011. A series of amateur radio classes were carried out so that students could learn the rules of work on the radio. It was a very interesting experience to carry out radio communications through amateur radio satellites and to take photos from NOAA satellites. In addition, we monitored other radio signals from thespace. Most emotions were from the radio contact with the ISS in the APRS system and from listening to ARISS contacts of other schools in Poland and Europe. 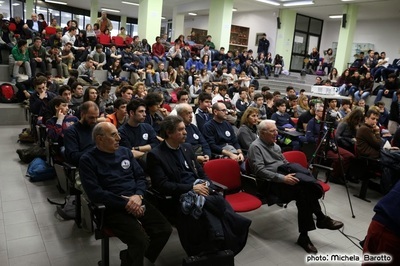 The schools participating in the ARISS program organized a series of events to promote various fields of science, particularly those that are the most relevant for the development of astronautics. Istituto Tecnico Industriale "Galileo Ferraris", San Giovanni Valdarno, Italy, direct via IQ5GX: Wed 2014-01-08 12:21:30 UTC 68 deg. Astronaut Wakata answered 19 questions by students. For a news release by the European Space Agency about the event, click here. The Technical Institute "Galileo Ferraris" is active on the territory of the Arno Valley since 1979 and has trained over the years the engineers of the many industrial enterprises in the area. The technical institute in fact offers a solid general education and training of scientific and technical basis necessary for both a rapid entry into the world of work and the professions and for the continuation of studies at university . In particular, enables the student to face the entrance test for the various scientific disciplines. • Electronics and Electrical Engineering. The time is for all specializations of 32 hours per week , spread over four days per week of five hours (from 8.10 am to 13.10) and two days a week for six hours (from 8.10 am to 14.10 ) . The school is equipped with several laboratories and a large gym . Among these we have laboratories for Physics, Chemistry , Drawing- CAD, Computer Science , Electronics, Electrical Engineering , Mathematics, Technology Design and Planning, Automatic Systems , and Information Systems . In addition, the school offers internships at companies in the area and technical projects in cooperation with such companies. Berkeley Middle School, Williamsburg, VA, USA, direct via K4RC: Wed 2014-01-08 18:33:50 UTC 78 deg. Read an advance news release about the contact. City County (Virginia), and it is one of three middle schools. There are thirty-six core teachers, sixteen elective teachers, a gifted and talented teacher, reading specialist, math specialist, and ten special education teachers. Additionally, there are three administrators, two school counselors, a Student Advancement Coach, and media specialist along with support staff. The student to teacher ratio is 28:1. Uniquely, the school is one of two located in the City of Williamsburg, serving students in the city and county. Over the past few years, enrollment has steadily increased, which is a direct reflection of the growth within the community. At the end of September 2013, the enrollment was 913 with an even distribution among its three grade levels (6-8). Berkeley’s student population is approximately 60 percent white, 30 percent black, and 10 percent identify as other ethnicities such as American Indian, Asian, Hispanic, etc. Nearly 30 percent of the student population receives special education services, close to 20 percent are identified as gifted and talented, and less than 5 percent identify as English Language Learners (ELL). At Berkeley, 41 percent of the students qualify for federal free or reduced lunch. In partnership with parents and community members, Berkeley strives to foster a safe, caring and supportive learning environment that: a) knows its population, b) maintains a culture of continuous improvement, c) maximizes learning time, and d) remains focused and determined to close the achievement gap. Contact with Primary and Junior High Schools Complex in Stobierna, Poland, via telebridge VK5ZAI was successful: Wed 2013-11-27 09:26:13 UTC 50 deg. Welcome back to the ISS and your first Exp. 38 ARISS contact, Koichi! School Complex in Stobierna is composed of two main school levels: primary school and junior high school. The primary school attendants are between the ages of six and 12. The junior high school students range from 13 to 16 years old. The students of these schools are interested in astronomical observations, thus they are eager to take part in special classes concerning such issues. We organized a series of educational trips to places from which students observed the sky, including the stars, planets and satellites. These activities were integrated into daily school activities in the field of physics and astronomy. Since many schools participated in the project, we organized inter-school competitions. A series of competitions related to astronautics was also organized. For the youngest students there was a drawing contest, and the contest for the older students was a multimedia presentation related to space flight and the history of the ISS. Contact with Salisbury Middle Schools, Salisbury, New Brunswick, Canada, telebridge via W6SRJ was successful. For the past several months, students and staff of Salisbury Middle School have been working hard in anticipation of this wonderful opportunity. Most obvious is how the students continue to learn and their excitement as they come together toward this common goal which they can all be proud of. In anticipation of the actual ARISS contact, the students have asked that it be proclaimed as “A Day to Space Out”. Activities have already begun with the official launch showcasing a video created by the students providing information regarding the event. Also created by the students are weekly special segments featured the Schools PodCast News Show which include short space related videos, ISS News and current expedition Astronaut biographies. The students have also enjoyed informative presentations from the Astronomical Society of New Brunswick and the Science East Planetarium . The Moncton Area Amateur Radio Club will be transmitting from SMS on November 15th, in conjunction with space related “Theme Day”. One creative student submitted an event logo which will be printed on tee-shirts and worn by students as they ask their questions. Austin Walker, now a software engineer, first participated in a regional annual Boy Scout event, Space Jam, held in Rantoul, Illinois, while in high school. “This is our seventh year doing it. It’s a blast every year,” said Walker. “Making contact with the International Space Station was one of the driving forces that helped create Space Jam,” said Walker. It was also a pivotal moment for Walker when in his third year at Space Jam he was in charge of making the initial contact with the astronaut. “I’ve always been interested in technology and science and being out in a rural setting, there’s not a lot of support,” said Walker. Walker graduated from Princeton University after being accepted on a full scholarship and now resides in San Francisco, CA “writing software for people,” as he put it. Walker explains his experience in a NASA video interview for its Station Inspiration Project. Contact with Rancho Romero Elementary School, Alamo, CA, USA, direct via KJ6TWN was successful: Wed 2013-11-13 19:44:17 UTC 84 deg. Students were able to complete 13 questions before signal was lost. The lead engineer was 16 year-old Rebecca Rubsamen, KJ6TWM, of Alamo, a sophomore at a local high school, who built her own VHF radio and the two large antennas in her backyard with the help of her father Reid Rubsamen, who is also an amateur radio enthusiast. ESA astronaut Luca Parmitano, KF5KDP, returned to Earth, November 11, 2013 along with Russian commander, Fyodor Yurchikhin and NASA astronaut, Karen Nyberg. They landed in the Kazakhstan steppe at 02:49 GMT (03:49 CEWT), in the same Soyuz TMA-09M spacecraft that flew them to the International Space Station on May 29th. Parmitano spent five months on the International Space Station for his VOLARE mission under a bilateral agreement with the Italian space agency and NASA. He conducted more than 30 scientific experiments, performed two spacewalks and operational tasks as well as maintaining the orbital outpost. Parmitano has proven to be an enthusiastic and passionate radio amateur with great availability for ARISS school contacts. When all questions prepared by the students could not be answered during the scheduled pass, Luca used to come back whenever possible to continue the space talk on the following orbit.In terms of ARISS school contacts performed during a single expedition, Parmitano is 4th in ranking of the ISS astronauts. Parmitano expressed his feelings regarding amateur radio in a message entitled "Message in a Bottle", published on the ESA blog. Parmitano went beyond his mandate as ISS crew member and Ham operator for ARISS school contacts, performing many random contacts with hams on Earth. Francesco De Paolis, IK0WGF, served as manager for the IR0ISS logbook, collecting reports from the ISS for most of the random contacts, totaling 231 QSOs. Our thanks to Luca Parmitano who did the effort to log the QSOs and to forward the log to Earth for almost all random contacts. The telebridge contact with Cradle of Aviation Museum, Garden City, NY, USA via IK1SLD on Nov. 4 was successful. Signals sounded good most of the way through the contact. All 14 questions were answered by astronaut, Luca Parmitano, K5FKDP. The direct contact with astronaut Parmitano and students at Warren County Technical School, Washington, NJ, USA was also successful Monday, Nov. 4. As part of the AMSAT celebration of 30 years of Amateur Radio traveling to space on manned space flight, ARISS Chairman, Frank Bauer KA3HDO was interviewed at NASA Mission Control, at Johnson Space Center. Listen to the interview. Astronaut Luca Parmitano, KF5KDP discovers the magic of Amateur Radio during a "blind time" on the ISS. Read his blog entry describing his experience. For a Polish translation, click here. 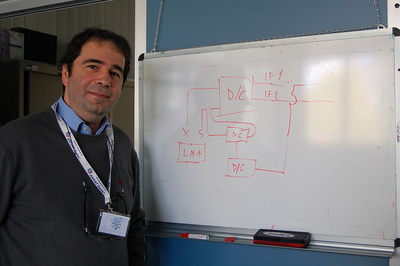 An ARRL news story features Parmitano's experience. Successful contact for Associazione Intercultura ONLUS in Frascati Italy. Luca Parmitano KF5KDP answered all 14 questions from the students and listened to greetings and applause from Frascati. Signal was loud and clear for almost the entire contact, AOS was at 17.02 UTC. Congratulations to IK0WGF team in Frascati coordinating the event and to telebridge station W6SRJ in Santa Rosa California. As usual we had also John Spasojevitch AG9D doing the forward on Echolink and IRLP network. Here the web story prepared by ESA for ARISS event in Frascati. An Amateur Radio on the International Space Station (ARISS) contact was made in Liceo Linguistico and Scuola Media Basel in Basel, Switzerland on Thursday, November 29 at 13:37 UTC via telebridge station W6SRJ in California. The contact complemented lesson plans covering space and space exploration. An Amateur Radio on the International Space Station (ARISS) contact was held between Kevin Ford, KF5GPP and students attending Liceo scientifico Giacinto De Sivo – Fondazione Villaggio dei Ragazzi in Maddaloni, Italy on Tuesday, November 20 via telebridge station IK1SLD in Italy. Over 300 students listened as the ISS astronaut fielded 15 questions posed by the youth. Ford requested a switch to the backup channel half way through the contact due to some interference, but the contact continued on nominally after the switch. 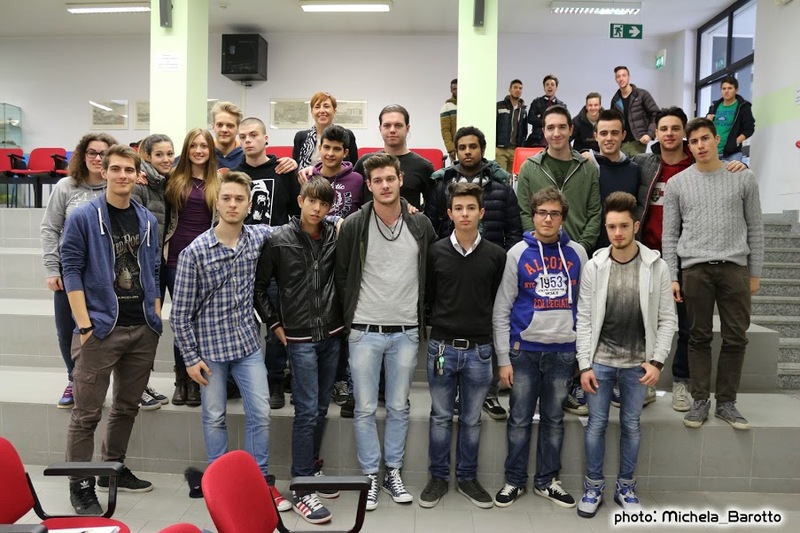 The event was webcast by AMSAT Italia and received good media coverage. The contact was integrated into lessons covering the developments in astronomy from a scientific, philosophical and literary point of view.